When Hyundai made it known in 2008 that it had no plans to launch a separate luxury brand to market its top of the line vehicles, this writer and many others did not expect that its marketing strategy would succeed. Five years have passed and we’ve been proven wrong as both its Genesis coupe and sedan, and its Equus sedan have enabled Hyundai to extend its reach into the premium segment. Indeed, Hyundai claims that its Genesis line and Equus sedan enable Hyundai to claim 9 percent of the premium market or well above the 5 percent market share the entire Hyundai brand enjoys. In 2012, Hyundai sold 33,978 Genesis units and 3,972 copies of its top-of-the-line Equus, seeing its share of the premium market increase from 8.8 to 9.0 percent. Within that market are the three segments where Hyundai competes: entry-premium coupe (Genesis coupe), mid-luxury (Genesis sedan) and premium luxury (Equus). 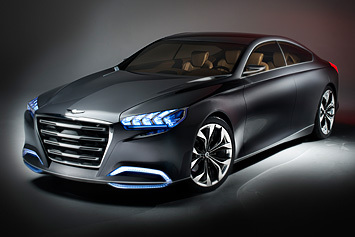 At the 2013 North American International Auto Show in Detroit, Hyundai revealed the HCD-14 Genesis concept, a vehicle it says provides a hint at the future technologies its premium models could offer. The concept reveals a stunning sedan design that could presage the next generation Genesis sedan or an all-new model, perhaps both. John Krafcik, president and CEO, Hyundai Motor America told NAIAS media representatives that the success of its current premium models …paves the way for a new generation of rear-wheel drive premium products. Krafcik added that the HCD-14 gives an …indication of the focus were placing on driving dynamics and technology. In recent years Hyundai has been using the term fluidic sculpture to describe the sculpture or body lines evident in its current design language. That design is most popularized in its midsize Hyundai Sonata sedan and is evident in its other cars. A variant of that language is apparent in its SUVs. The HCD-14 attempts to update that design language, at least for its top of the range models. The concepts face is described as bold with sporty LED headlamps flanking the sides. Deep fog lamp ports and a muscular hood advance this models premium look. The grille is as pronounced as you would find in an Audi, but with its own design characteristics present. The concept features a familiar sedan profile with a sharply tapered cabin and shore rear deck. Notably, the almost coupe-like look of the sedan offers hint of something unusual rear pivoting rear doors that provide ease of access to the second row. Such suicide doors are not commonly used these days, but have been played with by designers from time to time. Inside, the designers worked to make the cabin more ergonomically useful for the driver. Gone is the traditional center stack, replaced with a driver interface that Hyundai says is intuitive and offers 3-D hand-gesture recognition. The system makes use of eye-tracking, thumb controls and gesture recognition to control infotainment, audio, climate commands, navigation and smartphone access. A windshield head up display reduces driver distraction. Hyundai explains that its proprietary interface represents the companys vision for its premium vehicles, one that …sets a new benchmark in active driver safety technology. The HCD-14 concept is powered by Hyundais 5.0-liter TAU V-8 engine, an award-winning 32-valve motor currently available in the Genesis sedan and standard in the Hyundai Equus. That engine is paired with an eight-speed automatic transmission with manual shifting capabilities. The concept is equipped with paddle shifters for more engaged driving. As far as concepts go, Auto Trends sees this model going into production, perhaps without the rear pivoting rear doors. That latter change would be a shame as so-called safety concerns eliminate what we see as an important design characteristic for this handsome sedan.